City Hall (NS25/EW13) is an underground Mass Rapid Transit (MRT) station on the North South Line and the East West Line. This station was part of 2011 MRT train disruptions on 15 and 17 December 2011, caused by a misalignment between the trains' current collector shoes, which collect power from the third rail, and the third rail itself. These were Singapore's two largest MRT disruptions at the time of occurrence. There is a mural along the wall of the station called Vitreous Enamelled Mural by Simon Wong. However, this art piece is not under the Art in Transit scheme. 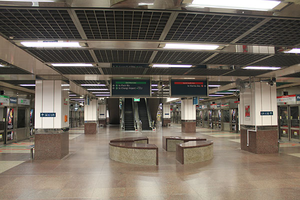 ↑ "Singapore's MRT Breakdown Chaos Leaves Thousands Stranded". Ignatius Low (The Straits Times, 16 December 2011). Retrieved 3 November 2012. ↑ "MRT breaks down again". Channel NewsAsia Retrieved 17 December 2011. ↑ "North-South Line service resumes after 7-hour disruption". Channel NewsAsia. Retrieved 17 December 2011. ↑ "Service disruption on North-South Line on 17 Dec 2011". SMRT Cooperation. This page was last modified on 24 April 2019, at 13:25.